T-R PHOTO BY STEPHEN KOENIGSFELD • Marshalltown’s Aspen Chadderdon dribbles the ball up the field from the defensive half during the second half of Tuesday night’s game against Des Moines Lincoln. 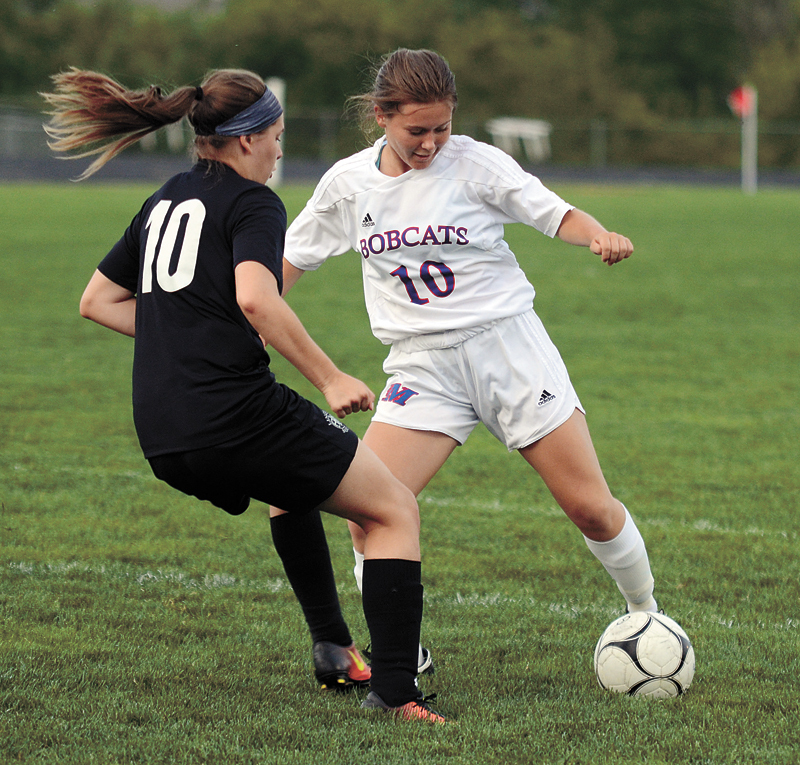 The Bobcats fell 1-0 in double-overtime. “One and done,” someone shouted, just before the first overtime began. One goal was all either Des Moines Lincoln or the Marshalltown girls’ soccer team needed when Tuesday night’s game went into extra time at Leonard Cole Field. And in the end, it was the Railspliters who got the one and were done. At the start of the 96th minute, Sophia Sanchez caught a cross from Laura Harper, corralled a rebound and the winning goal trickled in past Bobcat goalkeeper Victoria Johnson to sound the final siren. Johnson tallied 10 saves out of the Railspliters’ 11 shots on goal, and had what MHS head coach Stacy Galema said was her best game the year. From wire-to-wire, Johnson was focused and refused to let the hardest strikes or most strategic shots by her. 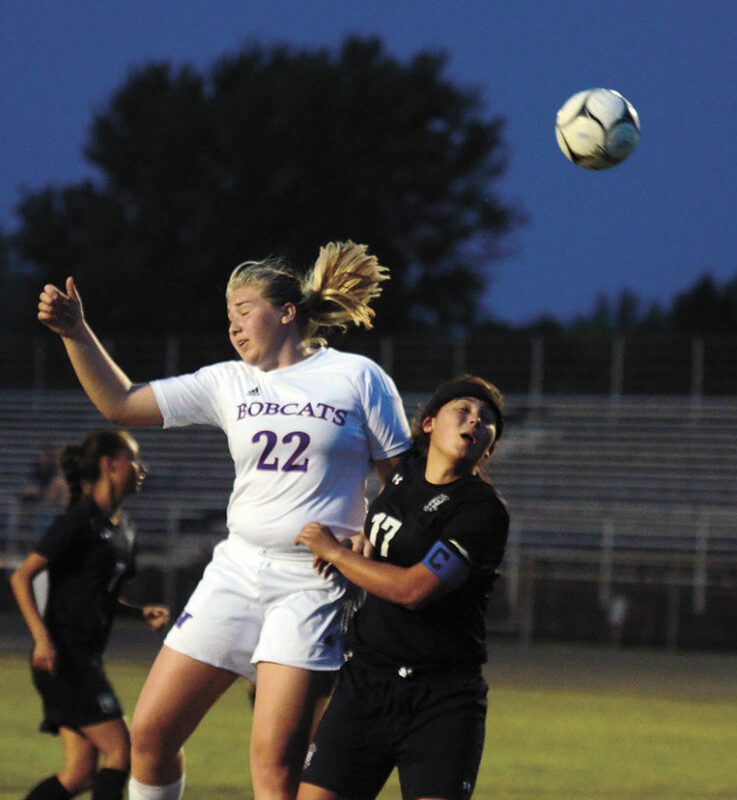 But the same issue that’s plagued the Bobcats (2-12) for the better part of the season was the downfall in the two overtime periods Tuesday night. T-R PHOTO BY STEPHEN KOENIGSFELD • McKenna Major works to dribble the ball by Des Moines Lincoln’s Sydney Wright during the first half of Tuesday night’s game against the Railspliters. 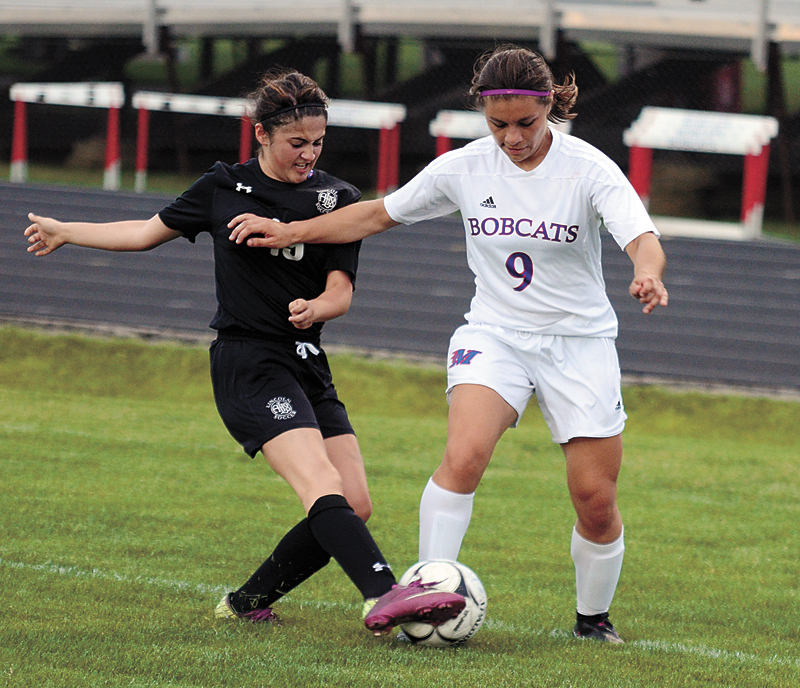 The Bobcats fell in double-overtime, 1-0. The Bobcats relied heavily on their defense in the two overtimes, so much that it resulted in zero shots or shots on goals in the 16 minutes of overtime. In all, Marshalltown had just six total shots, three of which — all coming in the first half — were on goal. The Railspliters (6-7) posted 19 total shots, three of which came in the two overtime periods, and 11 ended up being on goal. One included a penalty kick in the 28th minute that Johnson had to stretch out completely to get, and ended up denying. 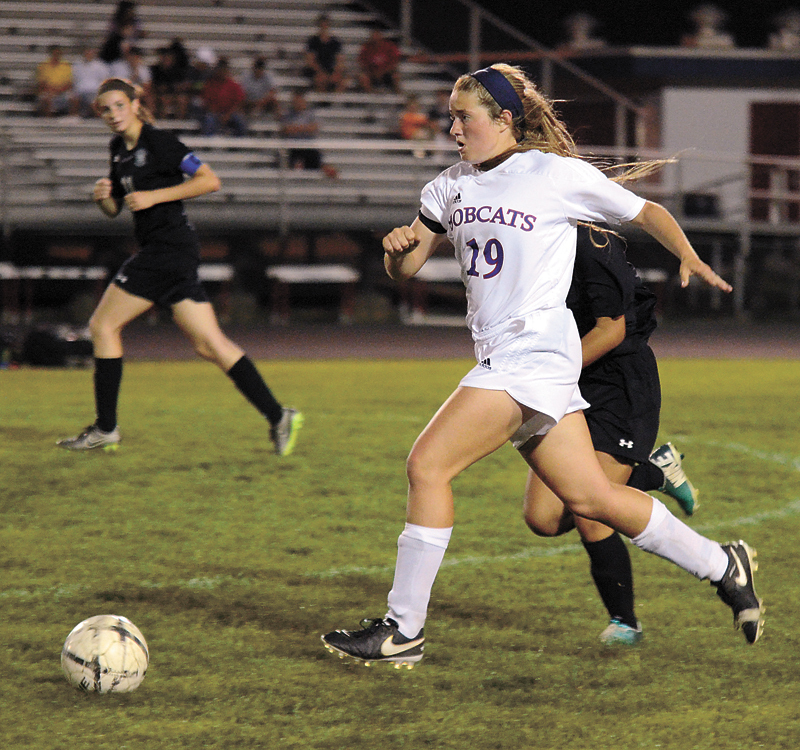 With two games left in the regular season, Galema said the Bobcats’ best is yet to come. They’re still searching to put together a game where they can win more 50/50 balls at midfield, rather than in the defensive half. Doing that will force the offensive front to control more and, for Marshalltown’s sake, come away with goals and a pair of wins. T-R PHOTO BY STEPHEN KOENIGSFELD • Vanessa Garcia Armas works to move by Des Moines Lincoln’s Ashley Medina during Tuesday night’s game at Marshalltown. 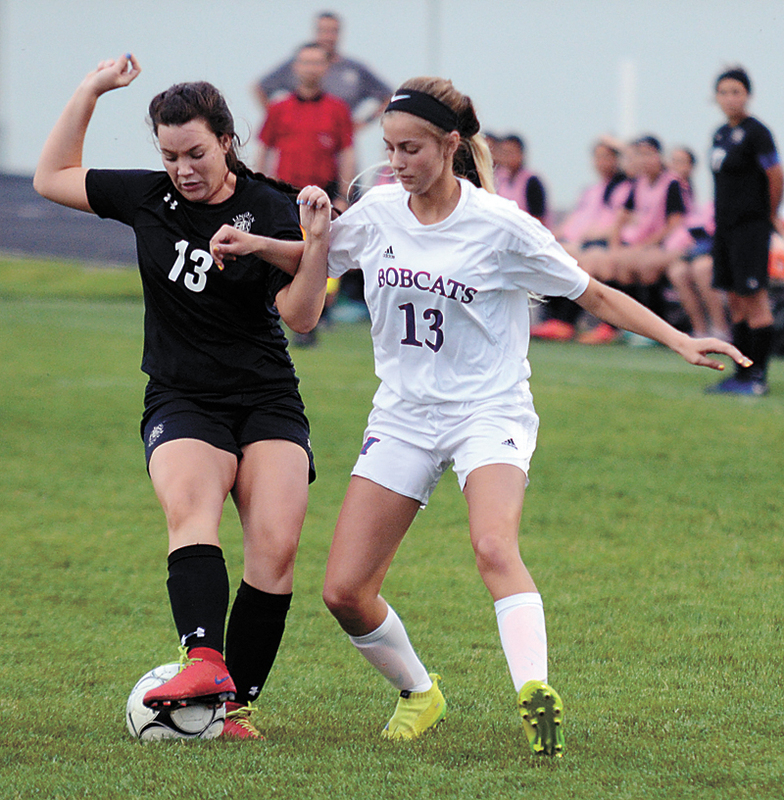 The Bobcats lost 1-0 in double-overtime. 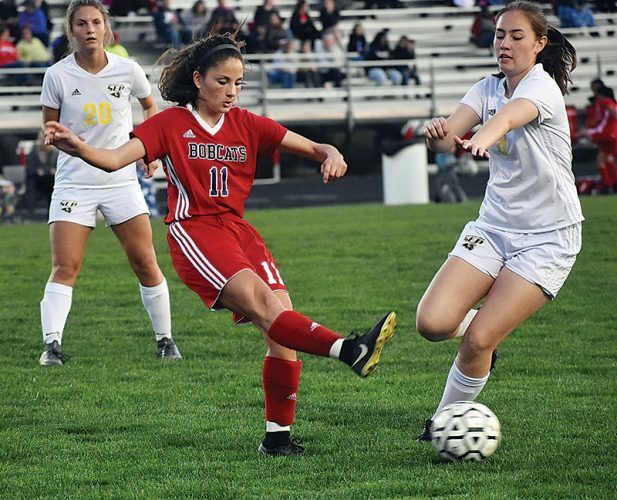 Macy Goecke, Vanessa Garcia Armas and Naomi Boland all had solid looks on their shots on goal, but subsequently were right into the arms of Des Moines Lincoln goalkeeper Allison Lane. Marshalltown forges on against a hot Des Moines North team (6-6) that has won three of its five games, before hosting a 2-10 Ottumwa team in the regular season finale at home. Galema said the Bobcats aren’t settling for the outcomes they’re being dealt. With a pair of games left in the regular season, there’s still time to showcase a year’s worth of practice and experience. 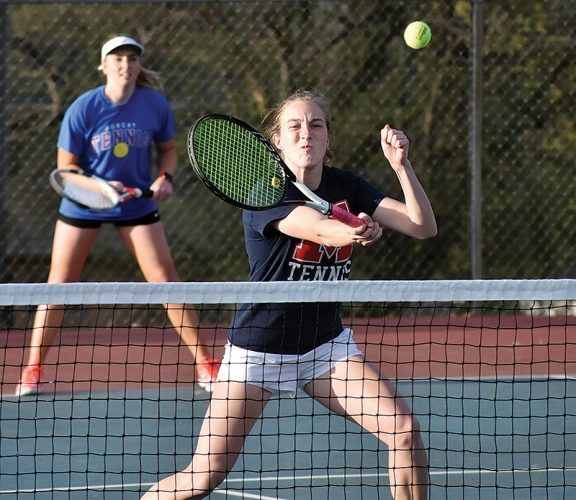 Marshalltown will head to North on Friday before coming back to take on Ottumwa on Tuesday. DML — Sophia Sanchez (Laura Harper), 96:00. Goalkeepers — DML: Allison Lane (3 shots on goal, 3 saves), MHS: Victoria Johnson (11-10). Yellow cards — Aspen Chadderdon, MHS, 36:20; DML bench, 77:50.